A year ago when we last focussed on metallurgical coal in this blog, prices had just shot up and the commodity was about to embark on a 12-month journey of great volatility and disruption. This sub-type of bituminous coal, also known as coking coal, emerged as the best performing commodity last year after several years of declining prices. 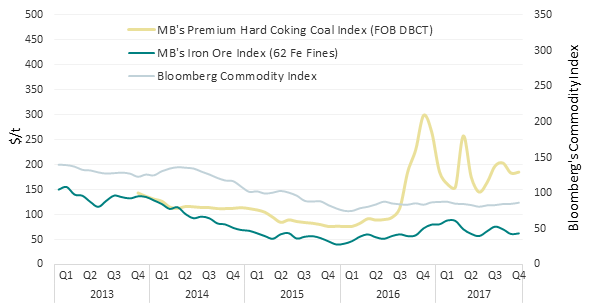 While Bloomberg’s Commodity Index rose about 10% in 2016, Metal Bulletin’s fob Australia premium hard coking coal index quadrupled from January to November last year, even climbing above $300 per tonne. Prices have dropped and spiked several times since then and the volatility continued in 2017 with a cyclone disrupting the market and eventually also affecting the way the commodity is priced. Although thermal coal prices also surged last year after several years of decline, they have been less volatile than coking coal prices. Coking coal has lower moisture and a greater calorific value than thermal coal, meaning that it releases more heat during combustion. It also has a higher carbon content than thermal coal. Those are crucial factors for driving off impurities and transforming metallurgical coal to coke - a form of almost pure carbon. The coke is then fed into the blast furnace to produce molten iron. The coking coal price is therefore closely linked to the dynamics of steelmaking economies. According to World Steel Association , 70% of steel produced today uses coal, and China is the most important part of the puzzle as it produces half of the total crude steel in the world. On top of rising coking coal demand in China, new restrictions on the mining industry which reduced domestic supply have put further upward pressure on metallurgical coal prices since last year. As explained in Metal Bulletin Research’s Steel Raw Materials Tracker , the Chinese government implemented a cap on the number of working days for miners, which curbed domestic production of metallurgical coal and helped push prices higher last year. Soaring metallurgical coal prices have greatly affected the costs involved in producing pig iron, a form of crude iron which is the product of the blast furnace. Metal Bulletin Research’s Steel Cost Service details how coking coal and coke costs usually averaged around 35% of total pig iron production expenditure in 2014 and 2015 while iron ore stood for the majority of costs. In the fourth quarter last year, coking coal overtook iron ore as the major cost in pig iron production and is now the most costly feedstock ingredient for each tonne of pig iron produced. Steelmakers have adapted by changing their mix of raw material in the blast furnace and are now using iron ores with higher Fe grades, which requires less metallurgical coal. The turbulent prices for coking coal widened the gap between the spot price and the quarterly benchmark price, especially after the cyclone in March. 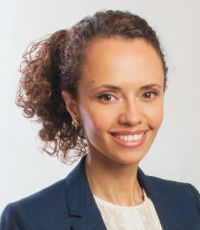 This caused the collapse in negotiations of the quarterly contract price between Australian producers and major Japanese buyers. Metal Bulletin recently reported that producers and consumers of coking coal have now begun to adopt index-linked prices as a pricing mechanism for their quarterly contract purchasing of seaborne feedstock, instead of settling on a contract price for the June quarter. After a year of surging prices, prices were expected to drop as export volumes from Australia returned to more normal levels. Metal Bulletin Research remained less bearish than most analysts and took first and second place in Metal Bulletin’s APEX leader board during the last two quarters. Prices did not fall so harshly as many had predicted and revived again in the third quarter, climbing above $200 per tonne in September (fob Australia) as supply tightness persisted and demand remained strong, especially in China. Chinese dependence on imports have been rising for several years and we expect this to continue, as explained in more detail in the Steel Raw Materials Tracker. Although Indian imports are expected to grow, it is not likely to offset the declining demand from China, the world’s largest coking coal consumer. Expectations for 2018 are bearish and most analysts forecast a fall in metallurgical coal prices, anticipating that fading Chinese crude steel production will dampen demand for metallurgical coal.